Display a Great Collection on a Dining Room Table ~ In the living room an elm plank table, which can double as a dining table, dramatically displays a collection of Chinese porcelains. The pieces don't have to exactly match, but they do have to play together well. 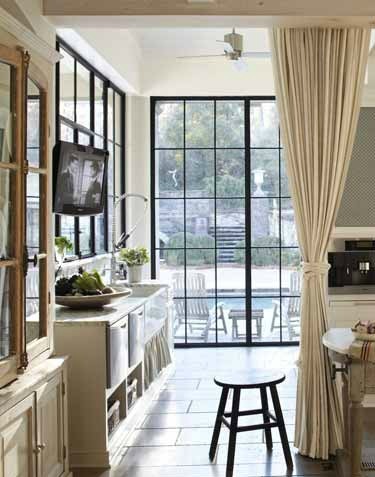 Hang an Interior Curtain ~ In the kitchen a linen curtain runs on a track spanning the room and can be pulled to conceal goings on in the kitchen. 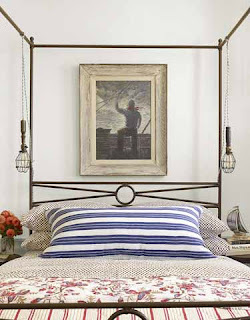 Mix and Match Your Bedding ~ The mix-and-match nature of the patterns and faded batik prints make it feel like it's a collection of old textiles. 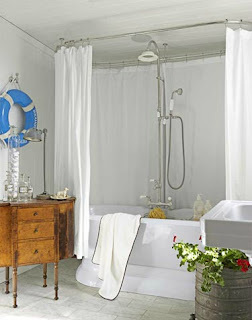 Put an Antique in the Bathroom ~ The bath feels authentic to the period of the house, but also clean and modern. Paint an Inexpensive Piece of Furniture White ~ This dining room, a former loggia, is light, bright, and airy. Take an old piece and gave it a fresh new look by the painting the base high-gloss white. 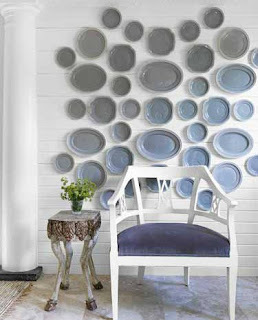 Cover a Wall with Plates ~ Covering the whole wall with plates has the same effect as "one big piece of art." They can be as cheap as you wish because no one will ever use them to know the difference! 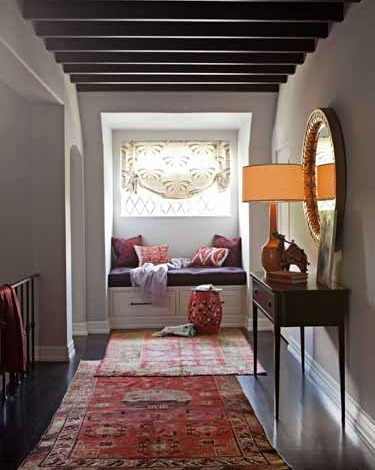 Dress Up Hallways with Turkish Runners ~ In the hallway overlap runners. The carpets can transform a plain hallway into a decorated space. 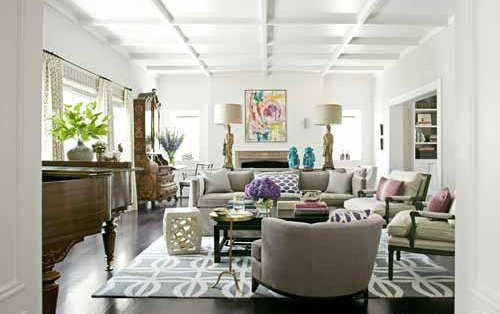 Move Seating Away From the Walls ~ Float furniture away from the walls: It creates more intimate seating, add a console table to separate back-to-back sofas. 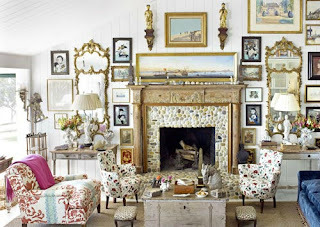 Reupholster Furniture with Old Curtains ~ The easy chair is covered in old dining room curtains.